America’s deadliest tornado season since 1953 continued its relentless onslaught of violent tornadoes yesterday. Numerous destructive and deadly tornadoes raked Oklahoma, Texas, Kansas, and Arkansas, killing at least nine people. Yesterday’s deadliest tornado hit El Reno and Piedmont, Oklahoma, about 30 miles to the west and northwest of Oklahoma City. Four people died, and one child is missing. Video of the damage from this tornado near the town of Piedmont shot by a news9.com helicopter shows damage characteristic of an EF-4 tornado, with many homes completely demolished and swept off their foundations. This tornado produced a wind gust of 151 mph at an Oklahoma Mesonet station in El Reno, Oklahoma. Figure 1. Radar reflectivity image of the supercell thunderstorm that spawned the Piedmont, Oklahoma tornado that killed at least four people about 30 miles northwest of Oklahoma City. Figure 2. Doppler velocity image of the supercell thunderstorm that spawned the Piedmont, Oklahoma tornado. Figure 3. 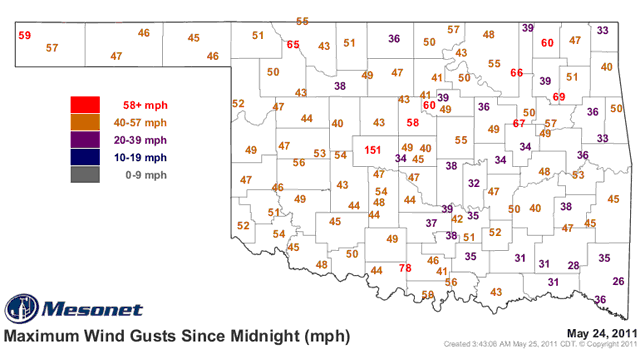 Top wind gusts recorded by the Oklahoma Mesonet yesterday showed that over 2/3 of the state received gusts of 40 mph or greater, and ten stations got gusts in excess of 58 mph (the definition of a severe thunderstorm.) A remarkable gust of 151 mph was recorded in El Reno, about 30 miles west of Oklahoma City. Figure 4. 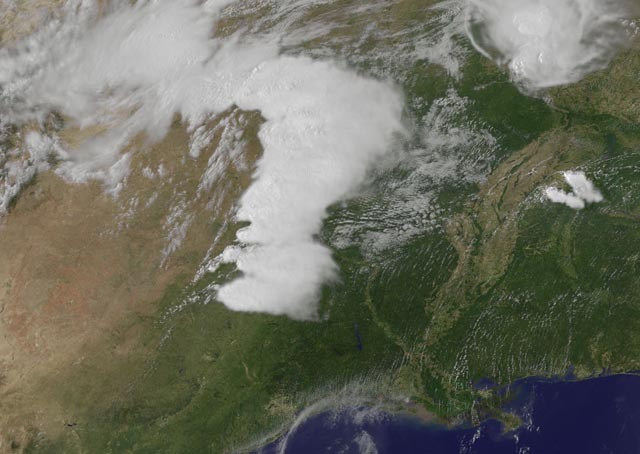 Satellite image taken at 22:32 UTC (6:32pm EDT) May 24, 2011, showing a line of tornadic thunderstorms over Oklahoma, Texas, and Kansas. Image credit: NASA/GSFC. Figure 5. Radar image of an unusual “J”-shaped tendril emerging from a tornadic thunderstorm near Dallas, Texas. This storm had unusually high radar reflectivity (note the pink colors of 70 dbZ echoes), because of large hail in the storm. This thunderstorm produced softball-sized hail (4.5 inch diameter. )Video 2. Chase video of several Oklahoma tornadoes intercepted yesterday by Reed Timmer of tornadovideos.net. The Springfield, Missouri office of the National Weather Service announced yesterday that storm surveys of the 7-mile long, 3/4 mile-wide path of damage carved by the Joplin tornado revealed that winds in the violent tornado exceeded 200 mph, making it the 4th EF-5 tornado of the year. The twister roared through Joplin beginning at 5:41pm CDT on Sunday, May 22. In nine terrifying minutes, the tornado killed at least 125 people, injured 750 more, and destroyed 2,000 buildings. NOAA’s Storm Prediction Center (SPC) rates this year’s Joplin tornado as the 8th deadliest U.S. tornado of all-time, and the deadliest since at least 1947, when a violent F-5 tornado hit Woodward, Oklahoma, killing 181. Catastrophe risk modeling firm EQECAT said yesterday that insured damages from the Joplin tornado could be between $1 billion and $3 billion dollars. According to NOAA’s National Severe Storm Laboratory, the costliest tornado between 1890 – 1999 was the May 3, 1999 Oklahoma City tornado, which did $1 billion in damage (1999 dollars.) There were no tornadoes during the period 2000 – 2010 capable of causing $1 billion in damage; the only two EF-5 tornadoes during that period, the 2007 Greensburg, Kansas tornado and the 2008 Parkersburg, Iowa tornado each did less than $300 million in damage. Thus, with the possible exception of this year’s Tuscaloosa-Birmingham tornado of April 27, the Joplin tornado is probably the most damaging tornado of all-time. The Storm Prediction Center has placed portions of seven states, from Arkansas to Indiana, in their “High Risk” region for severe weather potential, and warn of the potential for long-lived strong or violent tornadoes. This is their second consecutive “High Risk” forecast day, and fourth of the year. A high risk forecast was also issued on April 27, which was the busiest tornado day in world history, with 198 tornadoes occurring in a 24-hour period. Over 300 people died. 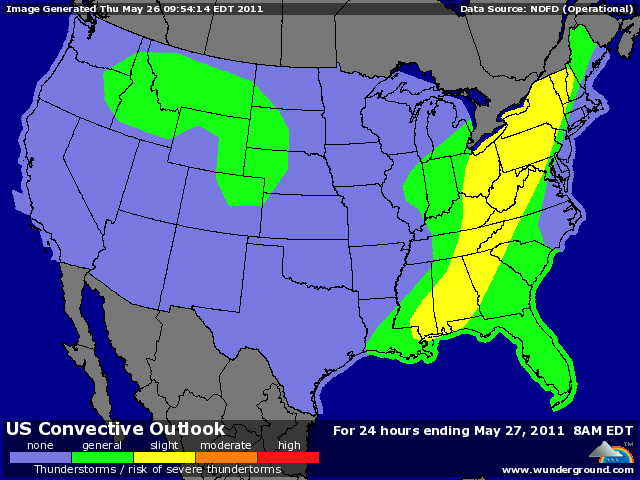 The other “High Risk” forecast by SPC came during the final day of the April 14 – 16 outbreak over the Southeast U.S. Fifty-two tornadoes hit that day, and 26 people died in North Carolina and Virginia. The severe weather threat will diminish considerably on Thursday, when only a slight risk of severe weather is expected from Alabama to New York. Figure 5. Severe weather threat for Wednesday, May 25, 2011. The New York Times has an interactive tornado fatality map showing how this year’s killer tornadoes have mostly clustered over the Southeast U.S., with the glaring exception of the Joplin, Missouri tornado. NOAA’s Visualization Laboratory has an impressive animation of the satellite imagery during the month of April, showing the locations of all the tornadoes as they happened. For those who want to lend a helping hand to those impacted by the widespread destruction this month’s severe weather has brought, stop by the Red Cross website, or portlight.org blog. Portlight has been very active bringing aid to the victims of this year’s tornadoes.